Melvin: How are you doing? Paul: It's great to be here with Melvin Masters. 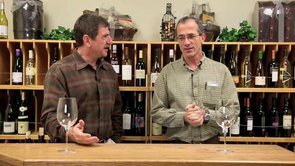 Paul: This is our continuing wine makers' series at Wine of the Month Club. 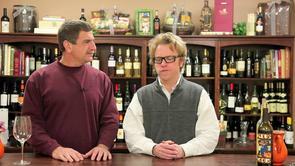 And we were tasting some wines, and I said, you know, we've got to get you on camera. Melvin: It's great to be here. Paul: It's been how many years that you've been coming around here? Melvin: Well, you know, I'm almost sure that I met your dad back in the '70s. But I've been seeing Paul here from the beginning, since the '90s. Paul: I think since when I took it over in '89, and we moved to Arcadia, and you came to me old little cubby hole of a place. Melvin: That's right. It was just little, it is, just one little office and you were almost doing the boxes yourself. Paul: That's right, practically. And what were we tasting? Melvin: I think that was it. And there's a bottle of Tiamo. Paul: Oh, there's the Tiamo. We're gonna taste that too. Melvin: This is my wine in incidentally. This is a little wine that I produce from Italy from the Veneto region. It's 100% organically farmed grapes. And the thing about organic, as you know there's a lot of nonsense talked about organic, and people don't understand quite what it is. This is not an organic wine; it is a wine that is made from organic grapes. So it's sort of like if you go and buy a 'tomato', or a 'tomarto', depending on where you come from, and you're making a sauce with it, you buy good quality tomato and you're going to make a better sauce. So the same theory holds with grapes; if you grow them organically, the fruits going to be better, and better fruit makes better wine. Paul: The difference with organically, and I've seen this many times, and I know- does it say here? Melvin: It is, right here on the label. Do you see? Right here. Paul: Oh, there it is. Right. We tasted this last night with the staff and we loved it, want to talk about tasting now, but that means the farming of the grape it organic. 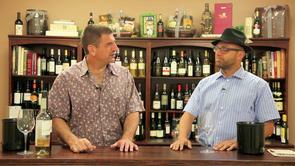 Paul: It doesn't mean that the winery facility has been certified organic. It could be operating that way. Paul: All kinds of things. Melvin: Secondary fermentation, and all that kind of stuff which can be exciting but not what you want. 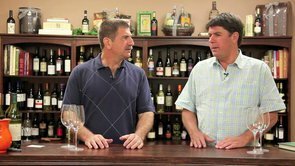 Paul: We're doing a video here soon where I'm going to go to the market with a list of foods that have more than ten parts per million of sulfur, which this wine is labeled as. Melvin: Very good, because people have this misconception. 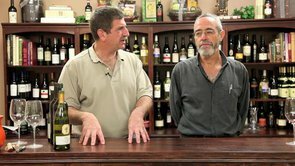 Melvin: And they say "Does the wine have sulfites?" Every wine, 99.9% of wines have sulfites. The reason people say "I get a headache from sulfates," is simply because they're probably buying a wine that actually has sugar added to it. That's what's giving them the headache. Paul: That's the headache. Let's taste this; that's your glass over there. Melvin: And the other problem is, you know, you're sitting on the beach in Saint Tropez, and you're drinking this beautiful wine in July and it tastes delicious, and then you have that same wine back in New York, it's February, and, hey, it doesn't taste the same. Paul: That's exactly right, they go "I had this wine, it tastes different to me," you were relaxed and you weren't doing anything. But you know what I like about this, we get a lot of Pinot Grigios in here, and I think that Veneto is the best place for Pinot Grigio, I think it should be bright, crisp, fruity, and fun to drink; I don't think it should be like Santa Maria which is oaked and expensive. Melvin: But you said the most important word to me, which is fruity, and I think a lot of Pinot Grigio are very one dimensional, it can be a very boring, boring white wine. Some of it is a little like good battery acid, but I think that Pinot Grigio needs fruit, and this has fruit. Tiamo means "I love you,"
Paul: That's right; I see it on the back, too. Italian lesson for the day. But I thought this was a beautiful package, I think the wine was a great indication of what Veneto Pinot Grigio should taste like. Paul: And it's organic too, which is really fun to have. Melvin: Breakfast of champions. We were just saying that the wine tree today is a little different from when Paul and I first met, isn't it? Paul: Ah, we figured it out. Melvin: That's right. And actually, it was in the old days, back in 1990 from France, all the wines that were sold were mostly from the name of the appellation, like Minervois, and corbieres, and so forth. And we decided to do a line of wines that had the varietal name on the label, and that was one of the first brands that did that. And then we sold it, and a few years later we started a thing called Tortoise Creek, which this is, and that was named actually after our house in Provence, which was actually- we had all these little tortoises running around, swimming in the stream, my wife would go and feed them, and they became known as the Liter family, with Hector Liter and Millie Liter and the little Centi Liters, so the house was called Le Riseau de Tortue, and this is my little wine. We actually buy the finished wine and do the blends, and this comes from a wonderful little wine maker- two little wine makers down in the Languedoc region, and what I love about this Paul is that you see that it doesn't have any oak, it's fresh, it's bright, it's such a pretty wine. Paul: I remember you bringing this, and I can't remember what facility I was in when you brought the original to our screen with a different label, but it's at least ten years. Melvin: Oh yeah, ten years, twelve. Yeah, absolutely. Paul: Wow, and that's great staying power in this business. It really is. The quality of the wines is good. The quality, that's what you get. You get good value. Melvin: That's right, staying power. Mind you, I think drinking lots of wine gives us staying power. Paul: It's a wonderful character, and it's not overdone, and you can have it with food, you can have it as an aperitif, and there's no RS in it I don't think, right? Melvin: No, no, I've never seen any at all. No, it's completely dry. Lovely little wine. Le Verge is the name of the vineyard it comes from, which means the orchards which has the old apricot trees all around the property. And then, lastly, this is something that we didn't make many cases of but I just love this little wine. It's like if you found yourself in a little bistro in the middle of nowhere in Provence or the Languedoc, and you went into this wonderful restaurant and you asked for a carafe of their best local wine, this is sort of kind of what it would taste like. Paul: Clearly from the nose, having gone through that experience, that's what you get. But the wine is better than those typically, those carafe wines. Paul: Can't wait to hear this. Melvin: The better we get. Melvin: So, that's my pitch, I'm sticking with it. 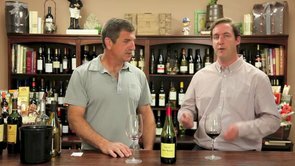 Paul: It's interesting, because you say that they're old vines, because usually you're going to make this big voluptuous old vine wine that's thick and dark, but here you've made some carbonic maceration out of it, which means it's whole berry fermentation, which tends to lighten things a little bit, but in this case I sense it but it's not overbearing. Melvin: No, it just brings out the fruit a little bit. It brings out the brightness and the freshness in it, but it still has that lovely old vine taste, it's got a little tiny bit of rusticality about it, I think it's just a great little wine. Paul: I'm going to ask you an industry question real fast before we get off here, and that is: In 1986 I was on my way to San Francisco, I ran into a friend of mine's father who as taking this idea to Napa, he worked for Reynolds Aluminum- which was putting a bag inside a box and selling wine, and now of course you see them around three-liters. A couple of years after that, at a family party I was talking to my wife's uncle who is a plastics engineer, and he had helped Coca-Cola develop a synthetic cork that they attached to a bar cap and they put it in their Taylor seller's wines. And that's '85 they were doing this. And now thirty years later now we see synthetic corks. 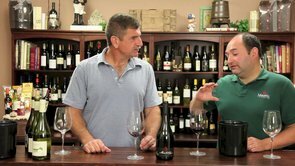 Paul: And now, the other day, South African wines came here in these things. 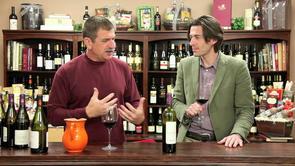 Paul: And I understand somebody in Beaujolais bottled this, and had a difficult time selling it. Do you think this has got any- what do you think? And this is a 750 ML bottle. Melvin: You know, I've got to tell you- this is plastic, right? Melvin: You know, I think there are sort of some negative feelings about plastic. 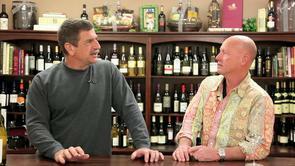 Melvin: Whether there's water that's in it, or whether there's wine in it. So I think there's that negativity about it. We were one of the pioneers with screw caps at Tortoise Creek. In fact, we went back, bizarre as it may seem, with the reds we went back to synthetic cork. Paul: Yeah, I see that. 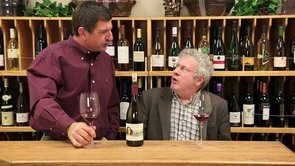 Melvin: Because the consumer, I think, still kind of thinks sometimes that a red wine adds a little bit of the romanticism to have a cork in it. Melvin: With white, I think it's OK with a screw cap. But I'm not sure- I think from an environmental point of view, you know, of the lightness of shipping, that's wonderful. That's terrific. Paul: I think thirty-six of these weigh the same as twelve glass bottles. Melvin: Well, the perfect way to do it is just to buy, you know, a barrel; keep it at home, have a straw, and just drink out of the barrel. Melvin: Paul, always great to see you old friend. Paul: See you guys next time.